There is something intrinsically fun about playing with your food. Children understand this. And we tell them not to do it because.. well.. we were taught not to do it and, goddammit, if we can’t do it, we won’t let anyone else do it either. So there. This is why I love meal-making with mince. Making mince mushy. Alliteration aside, when I’m preparing a meal out of paste that was once recognisable as meat, I’m instantly transported back to my youth: I’m 5 years old again, creating a mess with mala. Except my meat creations taste marginally better than my mala ones. 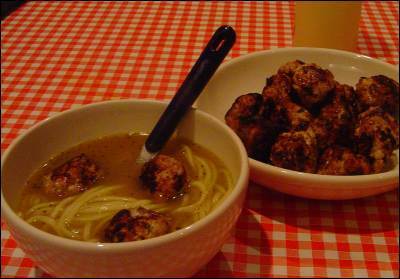 I’ve made a couple of batches of meatballs now, but the ones I made during the week were the first ones where the ingredients felt right. And best of all, it was thrown together in less than a half an hour when I got home late and wasn’t really in the mood for anything too complicated. Chop the onion really, really, really fine. It doesn’t have to be evenly chopped, a few larger bits here and there add to the texture. But it still needs to be thin. Similarly, chop the sausage into really, really, really small cubes. As small as you can. A good handful should do you. Crush the garlic with the side of your knife and then chop it fine. Throw the onion, sausage and garlic into a bowl with the pork mince along with two teaspons of the wholegrain mustard and about a teaspoon of the tabasco sauce. Roll the lime leaves in your fingers to crush it, then chop it to make sure it’s extra-fine and add it to the bowl. Season the mix generously. Now the fun part - mush the whole thing around until you get a consistent paste. All the ingredients should be roughly spread throughout the entire thing. Roll the whole thing up into little balls. There’s no rule as to the size of these, but I’ve found that they should fit in the palm of my hand, not on the palm of my hand. Does this make sense? Bear in mind, the size of the balls will affect the cooking time. Pour a good amount of oil (olive oil won’t splash, vegetable oil will) into a decent non-stick pan and get it good and hot. When it’s ready, start adding the meatballs. You’ll never have a completely round ball, so I’ve found it’s best to cook these on one side, until they’re on the point of burning, then flip them onto another side. When they’re a dark brown on most sides, you can start turning them more regularly, to cook the inside. Serve in some noodles with some chicken stock (Knorr do my favourite store-bought chicken stock right now).